Marble is a beautiful addition to a bathroom, and is being seen more and more as custom tiles in showers, or as solid marble in bathroom countertops. The stone offers an elegant and beautifully unique landscape and lends a sense of regality to the bathroom. Once your tile is installed by an Edmonton tile installers, or even as a maintenance option, you have the choice to seal your marble tile and the grout as well. Depending on what sealer you choose, this may be a semi-permanent or a full permanent option, as some sealers will penetrate and form everlasting (or close to) bonds with the marble. Sealing the tiles and grout will significantly extend the life of your marble shower, as well as making it much easier to clean and maintain. Before you consider sealing your tile, keep in mind that there is marble that does not need to be sealed. This is usually polished marble installed as larger slabs, and not as individually cut tiles. However, rough cut marble is much more porous than polished marble, and can be a candidate for sealing. If you are unsure which marble you have, contact a professional as they can test the marble for its absorbency. As polished marble has very little chance of water absorbency, there is a much less chance of staining, and therefore sealing is not really necessary. In addition, if the marble is not absorbent, then it will not absorb the sealer, and the sealer wont work. 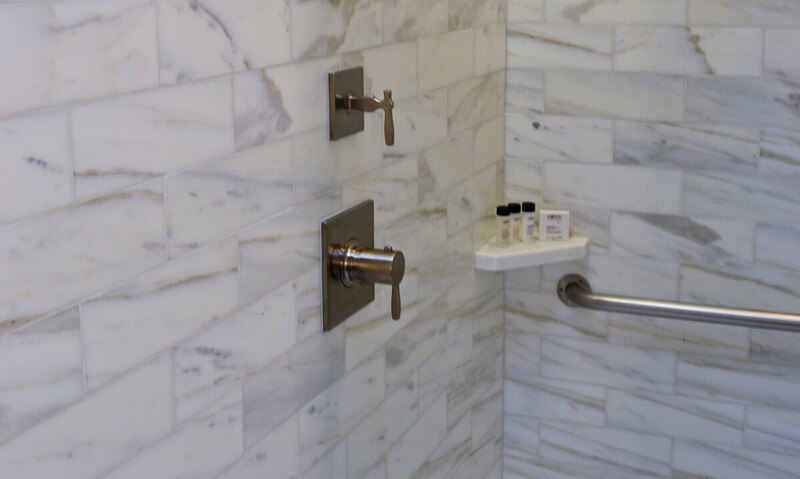 A major consideration when deciding whether or not to seal your marble shower is that hard water stains are a common theme in bathrooms, specifically in showers and baths. Sealing the marble will reduce the chances of hard water stains from setting in, or at the very least make it much harder to accumulate calcium and lime deposits over time. Another important factor is ensuring that there is no existing damage to the marble. If there are cracks, abrasions, or areas that have been poorly grouted, there is a high chance that water, moisture, or mold and mildew are trapped behind or in-between the marble. Sealing marble with this damage present can cause serious issues down the road, including shifting tiles, elongating exiting cracks, formation of new cracks, and displacement of the marble tiles. Not to mention the higher chance of serious mold or mildew growth behind the shower tiles. If any damage is suspected, please have it inspected by a professional tile installer before considering sealing the tile. If you have just constructed your home, and have chosen marble as a countertop or tile for the shower, we suggest you inspect it with your contractor prior to any final maintenance such as sealing, to catch any flaws before they become larger problems. While there are marble stone sealers that claim they can wick moisture away from the tile and grout, this is more of a shield that a solution, and should not be risked when damage is present. Assuming no damages, and you have chosen to seal your marble shower tiles, or your marble countertop, cleaning the marble should be as easy as using any low acidity, pH neutral bathroom cleaner. Please see our guide on cleaning marble countertops as you can apply this to the shower as well. Find more information in this article: “How to seal your granite countertop”.